Thank you everyone who attended our Sets on the Beach in 2017! We appreciate your participation. Please check out our other recurring events that support KJF. UW-Madison (& Tennis on Campus) Alumni Kelly Johnson hosted the first ever SETS ON THE BEACH Event in Milwaukee, WI on Saturday, May 6, 2017. The event was designed for players between the ages of 21-39 and costs only $10 per person. This event featured round robin 6 game pro-set doubles matches (Men’s, Women’s & Mixed draws). When your team is on your ‘Bye’ round, compete in on-court games to win a variety of WILSON tennis prizes! WILSON racquets will also be available to demo for those who do not bring their own. THEME: BEACH PARTY! – wear your Hawaiian shirt, sport some cool shades or that bucket hat while hitting that backhand slice or return winner! 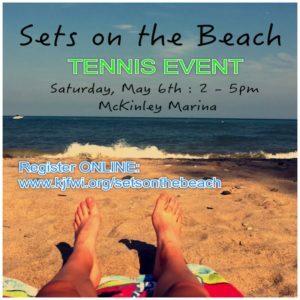 AFTER Tennis Play, all Participants are welcome to join us for our VIP Post Party on Bradford Beach – pickup volleyball game or Ultimate frisbee. Refreshments – snacks and beverages will be provided! ALL INCLUDED WITH YOUR ONLINE REGISTRATION. Sign-up for this EVENT as a free agent (we’ll help you with that) or with a partner for Men’s, Women’s or Mixed doubles. A Tennis On Campus Alumni Event. All collegiate skill levels welcome. No USTA membership required!